Gates are what make many of ICs, the two popular families are the 40xx CMOS and the 74xx TTL . Now 40xx come in 74HCT40xx flavors which approach the quality of an ideal gate. Entire circuits with Gates can also be also be burnt into PLDs, FPGAs and CPLDs just like you burn your CDROM. Gates can also be implemented in assembly language which a microcontroller like 8051 will understand and execute. Hardware gate circuit will operate in real time, propagation delay of nano seconds will be there due to parasitic gate capacitance or FET switching times. Software Gates using microcontroller and code will depend on both propagation delay of semiconductor, CPU clock speed and BUS width. This gate ANDs the two inputs A and B, The Output is high only if A AND B both are high. 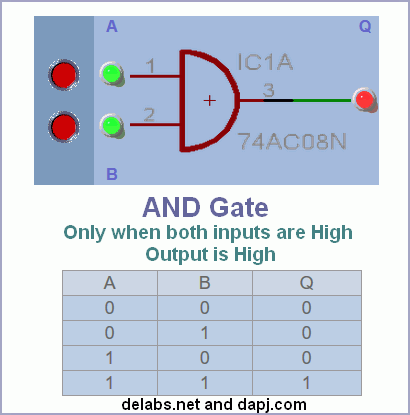 There may be a AND gate with many inputs, only if all inputs are high the output will be high. The AND gates can be built with diodes and transistors if you want to do it on your own. . More on TTL and CMOS here at Logic Family Voltage Translation.